Canon Revisited is an important book, and I hope everyone reads it. The first chapter leads off with a quote from Ernest Best: “No one has come up with a satisfactory solution as to how we determine which books should be in the canon” (15). It might be simplistically summarized that from beginning to end, this book exists to prove Best wrong. There are objections from many different quarters, all basically arguing that the Christian cannot know that the twenty-seven books in the Christian canon of the New Testament are the right books. According to Michael Kruger, the church is not under threat of a historical crisis, but rather, what is at its core, an “epistemological crisis” (19). And so Kruger has written this book with a modest goal: to show that “Christians do have sufficient grounds for claiming that they know which books belong in the New Testament” (295). It is here that one sees most clearly the method and assumptions Kruger will be employing in this book. Those with a bent towards presuppositional apologetic methodology will find themselves very much at home in this book. Since I lean that way in the first place, it was nice to see argumentation that did not seek to placate unbelieving approaches to the canon. 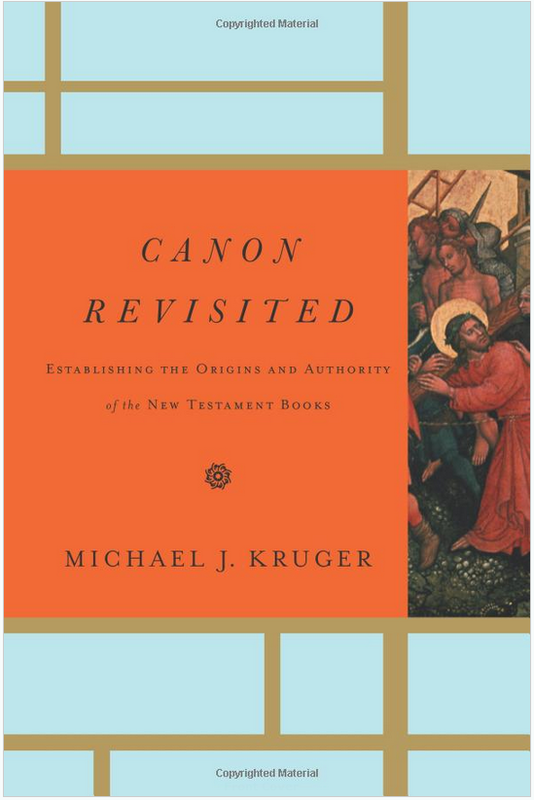 Rather as Kruger points out, if the argument is that Canon can only be explained in Christian categories, and if he is right that canon is ultimately a theological issue (294), then an accounting for the canon must take place on the Christian’s turf. There is simply no way to provide a theologically cogent account of canon in a satisfactory way while granting the skeptic’s presuppositions, since he brings assumptions to the table which already discount the answers which make the Christian view cohere. The book rests in some respects upon Alvin Plantinga’s work in the area of epistemological justification. Particularly, Kruger distinguishes between two specific challenges to the canon: de jure objections and de facto objections. De facto objections argue that a belief that we have the right books in our canon “is intellectually unacceptable on the grounds that it is false” (288). De jure objections, on the other hand, argue, “not that it is false, but that it is intellectually unjustifiable” (288). Kruger is clear that it is the de jure objection which this book is responding to. Once he has responded to the de jure objection, he reacts: “Whatever other objections the critic may have, it can no longer be this one” (295). It is not a book to destroy skepticism altogether, but to eliminate one powerful objection. The first half of the book is devoted to exploring the various canonical models that are out there and then concludes with a presentation of the self-attesting model of canon, which Kruger if himself advocating. The self-attesting model, Kruger is seeking to show, not only avoids the problems that the other views of canon present, but also provides a valid model for canonization which faithfully reflects the teachings of Scripture regarding itself. What is the self-attesting model of canon? In the simplest terms, Kruger explains that to say the Scriptures are self-attesting means that one turns to them in order to understand them. Put another way, “self authenticating” refers to the fact that “one cannot authenticate the canon without appealing to the canon” (91). A self-authenticating canon is not just a canon that claims to have authority, nor is it simply a canon that bears internal evidence of authority, but one that guides and determines how that authority is to be established (91). This is something which is denied by all the other models of canon. As Kruger says, “all these models share one core characteristic. They all ground the authority of the canon in something outside the canon itself. It is this appeal to an external authority that unites all these positions” (88). What are these positions? Put briefly, the other models can be reduced to Community Determined models and Historically Determined models. There are variations within each of these models and nuances which deserve attention, but at the end of the day, as Kruger has already said, the determination of the canon is either put into the hands of the church, church leaders, or church historians with these views. Historical judgment cannot be the final and sole ground for the church’s accepting the New Testament as canonical. To accept the New Testament on that ground would mean the church would ultimately be basing its faith on the results of historical investigation (113). The choice is between models which rely upon various external authorities an finding a model which is consistent from beginning to end in its theology of canon. Kruger argues (and I agree) that the self-attesting model is such a model. Kruger argues, as he develops the self-attesting model, that the Bible testifies to an “epistemic environment wherein belief in the New Testament canon can be reliably formed,” including three features: (1) Providential exposure of the church to the canon, (2) Attributes of canonicity, and (3) Internal testimony of the Holy Spirit. As Kruger explains, “These three components must all be in place if we are to have knowledge of the canon” (94). Kruger also spends much time on (2) discussing what exactly the attributes of canonicity are. He argues that there are three attributes of canonicity – each of which make appearances – to a greater or lesser degree – in the other models of canon. What makes Kruger’s approach different, however, is his insistence that a canonical book will possess all three of these attributes: (a) divine qualities, (b) corporate reception by the church, and (c) apostolic origins. Now, these three attributes are not enough. Even if a book does possess all of these things, features (1) and (3) must also be present. Kruger looks to Scripture to derive this model and all of its features – I think he does it quite effectively. In fact, much more could be said. Kruger shows much restraint, in a lot of ways. Meredith Kline’s discussion in the first hundred or so pages of The Structure of Biblical Authority make a strong case that the canon itself can be entirely constructed based on the Bible’s internal covenantal structure. Kruger gives Kline a brief mention, and if you follow up on Kruger’s footnotes you’ll find a wealth of information which is highly beneficial in this respect. In the last two chapters, Kruger addresses other defeaters. Modern liberal scholarship largely tends to claim that there was disagreement over the contents of the canon, and assumes that a divinely inspired canon would not entail as much disagreement as was involved in the development of the canon. Of course, this assumption of such scholars is highly questionable and assumes that disagreement in the early church is inconsistent with the self-authenticating model (which Kruger makes clear it is not – in fact it is expected). Furthermore, Kruger says, the critics are exaggerating the nature of the disagreements. So much more could be said in commendation of Kruger’s book. It is my personal belief that Canon Revisited will be key in providing structure for future discussions of the canon. The book is logically structured, rigorously argued, and is Biblically centered, as would be expected for a book seeking to consistently apply the teachings of Scripture to the structure of the Biblical canon. After reading Canon Revisited, my own understanding of the canon has been deeply enriched. I want to recommend this book to others as highly as I possibly can. It will be considered the major work on canon from an advocate of the self-attesting model for years to come. Are there any books that have the features listed under (2) but not (1) and (3)? No. Apart fromt these three features there is no proper epistemic environment in which to recognize a book as part of the canon.